According to a reliable source, when it was first started in 1989 the Floyd Chamber of Commerce was populated by traditional business owners. Then over the years the membership supposedly became dominated by tourist related businesses. When we came here more than a year ago, the Chamber office was only open one day a week and we heard various and sundry opinions that the Chamber did not accurately represent the entire business community, etc., etc. We could not really judge whether this was true, but it certainly appeared that the Chamber lacked widespread support. I think that the Chamber is now making significant moves toward correcting this situation because they just held their first Business After Hours event and attracted a capacity crowd by opening the event to non-Chamber of Commerce business owners. Eighty people wedged themselves into the Historic Pine Tavern in Floyd Wednesday night and made this Business After Hours meeting a huge success. I was there as one of the nonmembers and it was a real eye-opener. We enjoyed delicious food, established new business relationships and we all had a marvelous time. Animated conversations ran non-stop from 5:30 to well beyond 8:00 pm. I saw people from all segments of our Floyd economy. We were all there together, old hippies, old techies, independent crafters, contractors, local business owners and a handful of local government officials. It was reassuring to see the mutual support that existed and the business opportunities that presented themselves at every turn. If someone didn’t find a business opportunity in that gathering, my feeling was that they weren’t really trying. It was a spirited meeting of friends, introduction to new friends and development of future business relationships. It was the natural kind of networking that energizes a business community and can produce lasting results if continued. Judging from the enthusiasm shown by all attendees, this Business After Hours could become a new Floyd tradition. It is a vital step in the right direction and I will do everything possible to support it. Oh, and did I mention the food? It was the perfect complement to this meeting! Our host Reed Embrey presented the guests with a stunning array of delectable morsels including fried oysters, beef on skewers, several chicken delicacies, and absolutely marvelous bruschettas. And that was merely the beginning! I am truly sorry that I was not able to capture a picture of the food, but it was a choice of eating or shooting and my appetite won out. We scarfed down these tasty morsels and it looked like the late comers were going to be out of luck because the food just melted away, but Reed and his kitchen staff kept the taste treats coming until all were satisfied. He did a fantastic job. With great food and interesting conversation, this was an evening not to be missed. 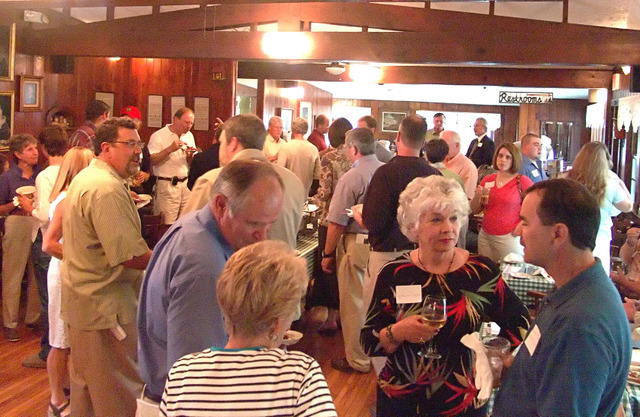 The next Business After Hours meeting will be hosted on July 18th by Citizens. If you are in the Floyd area, you should mark your calendar so you can promote your business and meet a dynamic group of people. The take away lesson for me was that opening social meeting to non-members is a good way to expand your contacts and your membership. It’s an application of the most basic rules of business communication. It goes like this: First get in communication with people and get to know them well as individuals, then find areas of mutual need and interest. After that it’s almost impossible to avoid doing business with each other! If you have an organization that is not growing and attracting support, you might want to consider doing something along the same line as this Chamber did. Make sure that your food is as good as you can manage. It really does makes a difference. This entry was posted in Basic Business Concepts and tagged Business After Hours, Chamber of Commerce, Floyd Virginia, Historic Pine Tavern, Reed Embrey. Bookmark the permalink.